Non-GMO 5 grain scratch now available here at Dunreath Farm. $17.95 for a 50 pound bag. Our custom blend scratch contains: Non-GMO Corn, Peanuts, Peanut Hearts, Wheat, Barley, and Sunflower Seeds. Chickens are compelled to scratch at the ground. They use their toes to mix up litter or scrape the ground in search of various seeds, greens, grit, or insects to eat. In the Winter, the seeds, greens and insects have all but disappeared. Scratch grains are a great treat and encourage their instinctive behavior of scratching the ground. Besides being a treat, when the chickens digest scratch grains, it creates energy and helps keep them warm at night. Feeding scratch grains routinely will create a bond between you and your chickens. 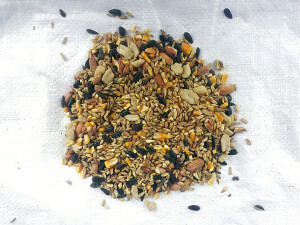 Scratch grains should be fed to chickens late in the afternoon after birds have eaten complete feed, and then provide only as much scratch grains as chickens can finish in 15 to 20 minutes. 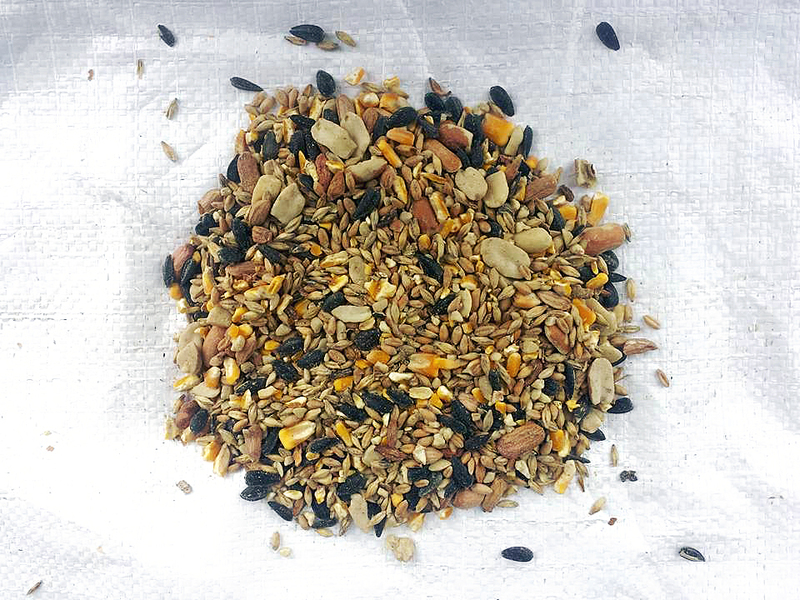 Do not mix scratch grains with their complete feed, it will dilute the nutrient formula of the complete feed. When feeding scratch grains to chickens, it is also important to provide grit to help the chickens grind and digest the grains properly. If chickens have access to the ground, they can typically find enough grit in the form for small rocks or pebbles, but it is helpful to supply commercial grit, which is available in chick or hen size. Fine gravel is an acceptable substitute for commercial grit. Oyster shell should not be used as grit since it is too soft and does not aid in grinding. In addition, growing chickens have a lower calcium requirement, and too much calcium can adversely affect their kidneys.